Wainwrights Pictorial Guide to the Southern Fells has route descriptions for Scafell Pike, Scafell, and all the other fells in the Scafell range. The quotes used on this page were taken from this book. Scafell Pike (top centre) seen from the Long Green ridge leading to Scafell summit. This view of Scafell Pike shows its southern flank high above the path climbing from Cam Spout to Mickledore. The southern peak of Scafell Pike is more prominent from this direction. The main summit of Scafell Pike is slightly behind to the left. Ill Crag and Esk Hause can be seen on the top right of the image. Photograph by Ann Bowker. 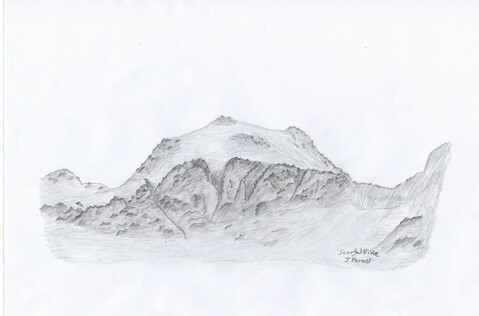 Sketch of Scafell Pike - viewed from the Wasdale side. One characteristic noted by Wainwright and by any fell walker who has undertaken the walk from Borrowdale, Great Langdale and Eskdale, is the distance needed to be travelled to actually reach the summit. A friend of mine joked about needing to set up a base camp in order to reach Scafell Pike summit. The routes from Borrowdale and Eskdale, involve a great deal of walking before you actually see anything of Scafell Pike itself. Alfred Wainwright advises walkers not to underestimate the amount of work required to reach Scafell Pike. He writes "The ascent of Scafell Pike is the toughest proposition the ‘collector of summits’ is called upon to attempt .... From all bases except Wasdale Head the climb is long and arduous and progress is slow: this is a full-day expedition, and the appropriate preparations should be made" (Wainwright 1960, Scafell Pike 12). Part of the reason for this is that Scafell Pike is just one summit in a spectacular range of fells. So much walking over foothills is required before the main range is reached, and the final ascents are made. The exception to this is, as Wainwright points out above, the Wasdale Head via Lingmell Gill route, which is the most direct and hence the shortest distance. Two Scafell Pike Routes - These two YouTube videos from Wasdale Mountain Rescue and Walking Englishman show a couple of different routes to Scafell Pike. The one made by Wasdale Mountain Rescue shows the above mentioned route from Wasdale Head via Lingmell Gill. The one made by Walking Englishman shows the route from Seathwaite in Borrowdale. The latter walk also includes the Scafell summit as well as Scafell pike. This is a rough Map of the Scafell Pike range. Click on the map markers to see the names of the fells around Scafell Pike. There is an Ordnance Survey map of Scafell Pike on a separate page. This page also has a link to download a 3d Map of Scafell Pike with routes (displays in Google Earth). The Scafell Pike massif includes the summits of Great End, Broad Crag, Ill Crag, Scafell Pike, Lingmell and Scafell. It is interesting to note that Scafell and Scafell Pike are actually two separate neighbouring fells. 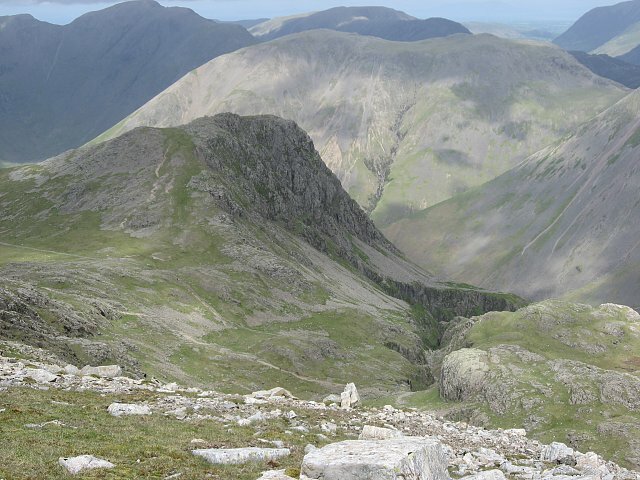 Wainwright also classifies Great End as being a separate fell in its own right, whilst Ill Crag and Broad Crag are regarded as being two of the three Scafell Pikes. Writing about Ill Crag, Broad Crag and Scafell Pike, along with the rest of the Scafell range, Wainwright notes that “The three summits rise from the main spine of an elevated ridge which keeps above 2800 feet to its abrupt termination in the cliffs of Great End, facing north to Borrowdale; lower spurs then run down to that valley. In the opposite direction, southwest, across the deep gulf of Mickledore, is the tremendous rock-wall of the neighbouring and separate mountain of Scafell” (Wainwright 1960, Scafell Pike 5). At 964 meters, Scafell is not quite as high as Scafell Pike. 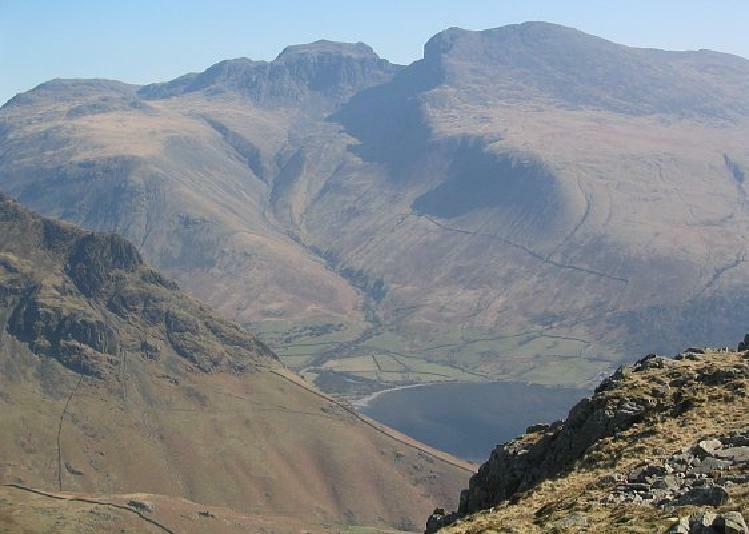 But despite this fact, Wainwright notes that Scafell is traditionally regarded as the "superior" mountain in the range. The reason for this is to do with spectacular rock faces above Mickledore. He writes "This respect is inspired not by the western flank going down to Wasdale nor by the broad southern slopes ending in the Eskdale foothills but rather by the towering rampart of shadowed crags, facing north and east below the summit, a spectacle of massive strength and savage wildness but without beauty, an awesome and a humbling scene" (Wainwright 1960, Scafell 2). One of the best vantage points for seeing the whole the Scafell range is the summit of Bowfell above Langdale. From here it is possible to see the whole ridge from Great End, past Ill Crag, Broad Crag, Scafell Pike itself and Scafell. From here the Cliffs of Broad Stand which separate Scafell from Scafell Pike above Mickledore are very pronounced. This view of the Scafell range is looking west across Upper Eskdale to Scafell Pike in the centre. Scafell itself is on the left, with the cliffs of Broad Stand towering above the col of Mickledore. Broad Stand is impassable to walkers. As Wainwright wrote in his book on the Southern Fells, "The greatest single obstacle confronting ridge-walkers on the hills of Lakeland is the notorious Broad Stand, with which every traveller from Scafell Pike to Scafell comes face to face at the far end of the Mickledore traverse. Obstacles met on other ridges can be overcome or easily by-passed; not so Broad Stand" (Wainwright 1960, Scafell 3). 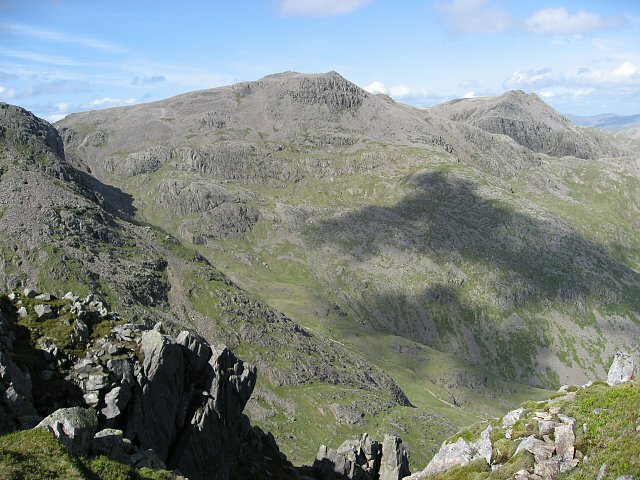 As such, routes between Scafell Pike and Scafell involve a steep descent from Mickledore to Lords Rake (west) or the gulley leading to Foxes Tarn (east) before the ascent to Scafell summit can be made. Photograph by Ann Bowker. The Scafell range seen from the summit of Great Gable. Lingmell Crag is located in the foreground with Scafell Pike behind and slightly to the left. 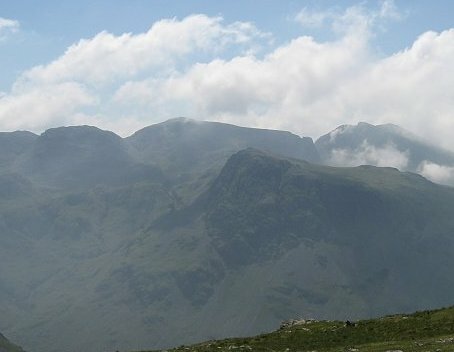 Broad Crag can be seen to the left of the main Pike, and Scafell itself can be seen surrounded by cloud on the right. Pikes Crag and Pulpit Rock are also visible on the right flank of Scafell Pike. Photograph by Ann Bowker. 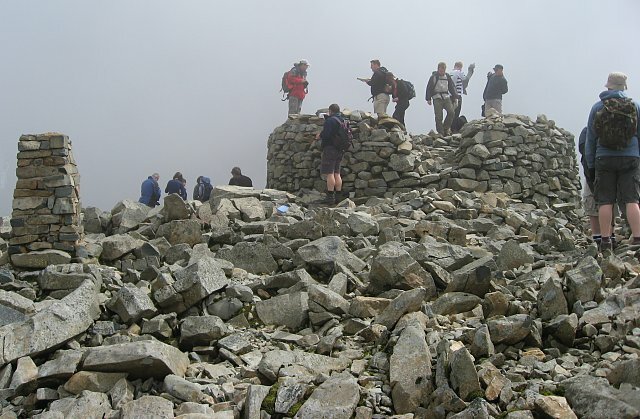 The height of Scafell Pike is 978 meters (3,210 feet). It is the highest mountain in England, but not quite as high as Snowdon (1,085m / 3,560ft), or Ben Nevis (1,345m / 4,413ft), the highest mountains in Wales and Scotland respectively. Scafell Pike is one of the mountains ascended each year by participants of the National Three Peaks Challenge – the other two peaks being Snowdon and Ben Nevis. The challenge involves climbing all three peaks in turn within 24 hours. Scafell Pike is just one peak in a larger massif of adjoining fells. The main summits in the massif are Great End, Ill Crag, Broad Crag, Scafell Pike and Scafell. The summits start at Great End in the north-east and run south-west to the summit of Scafell, covering a distance of just under two miles. Each of the summits is over 900 meters in height. Scafell Pike and Scafell are actually two separate and distinct fells. However, because they have similar names, most people incorrectly assume they refer to the same peak. The two fells are adjoining, but are separated by the ridge of Mickledore and cliffs of Broad Stand. The main walking routes to Scafell Pike summit start from the surrounding valleys of Wasdale, Borrowdale, Great Langdale, and Eskdale. The route from Wasdale via Lingmel Gill and Mickledore is the shortest and most direct, being approximately 3.5 miles in length (one way). The routes from Borrowdale, Eskdale and Great Langdale are all over 5 miles in length, involving a ten mile round trip at the least. (Wainwright 1960, Scafell Pike, 23). This is Scafell Pike summit with its cairn and trig point. The cairn is slightly unusual in that people can climb up some rocky steps to stand on a round platform. Once here, you are in no doubt that you have arrived at the highest point on Scafell Pike. Note also the rocky terrain all around. This ruggedness is one of Scafell Pike's characteristics mentioned in the quote by Wainwright at the top of the page. Photograph by Ann Bowker. View of Scafell Pike from Great End. Ill Crag can be seen on the far left, whilst Broad Crag can be seen directly below the main summit of the Pike. Ascents to Scafell Pike made from Esk Hause involve traveling along this rocky ridge. The path first passes over Ill Crag before reaching Broad Crag. Here it drops into Broad Crag Col, and then makes the final ascent to the top of Scafell Pike. Photograph by Ann Bowker. Download the 3D Map of Scafell Pike with walking routes plotted from Wasdale, Borrowdale, Great Langdale and Eskdale. Once you've downloaded the 3d Map of Scafell Pike, I recommend you check out the cliffs and crags around Mickledore which lend themselves to exploration in particular. The 3d images of Broad Stand, are really impressive. Use the Navigation Controls to see this towering rock face from different perspectives. Scafell Pike at top of Piers Gill. On the north face of Scafell Pike there is a deep gash leading up towards the pike below the crag of Lingmell. Wainwright writes “The north face of Lingmell and the great ravine of Piers Gill make as wild a scene as can be found anywhere ...” (Wainwright, Lingmell 6). There is a pathless route to Scafell Pike that follows the gill on the eastern side (see Wainwright, Scafell Pike 14). Photograph by Ann Bowker. In Alfred Wainwright's Pictorial Guide to the Southern Fells, he gives this inspiring description of the Scafell - Bowfell range in graphic terms. He States "Within this area the fells are the highest, the roughest, and the grandest in Lakeland: they are of volcanic origin and the naked rock is much in evidence in the form of towering crags and wildernesses of boulders and scree ... there is an exhilarating feeling of freedom and sense of achievement on the airy ridges poised high above deep valleys. This is magnificent territory for the fell walker. There is nothing better than this." (Wainwright 1960, Introduction to The Southern Fells). The first time I saw the Scafell Pike range I was completely awestruck. I was heading up towards Styhead from Seathwaite in Borrowdale. In the far distance Lingmell Crag on Scafell Pikes north-west flank came into view. As I continued along it appeared massive, dark and formidable, yet completely intriguing. I was doing a route to the neighbouring fell of Great Gable that day, and as I made the steep ascent from Styhead to its summit, more and more of the Scafell range came into view as I looked back. It was a spectacular sight on a cold and crystal clear April day. Later on that year I saw the eastern side of Scafell Pike range from the summit rocks of Bowfell. This view was no less impressive. It was a warm summer day, still clear, but this time with grey clouds brushing over the Scafell Pike summits, occasionally obscuring the highest tops. I was particularly struck by the shape of the towering rocks of Broadstand, and how the fells of Scafell and Scafell Pike rose up from the connecting ridge of Mickledore. I didn't know any of these names at that point - except Scafell Pike itself, but these spectacular views inspired me to research the area on the OS Explorer Map, and a month later I visited Scafell Pike summit myself. Read about this walk to Scafell Pike in my Lake District Walks blog.